For more than two decades, people recovering from alcohol dependence have had the benefit of acamprosate; a drug that can be combined with appropriate counselling to reduce the chances of relapse. The drug was first approved for use in Europe in 1989. Long-term abuse of alcohol results in chemical changes in the brain. Those chemical changes make it exponentially easier to relapse the longer a person has abused alcohol. Acamprosate was developed to level the playing field between the desire to stop using alcohol and the natural cravings presented by the brain. Because the action of mechanism is largely unknown, it is hard to classify acamprosate as a specific type of drug in the same way you would classify aspirin as an analgesic. 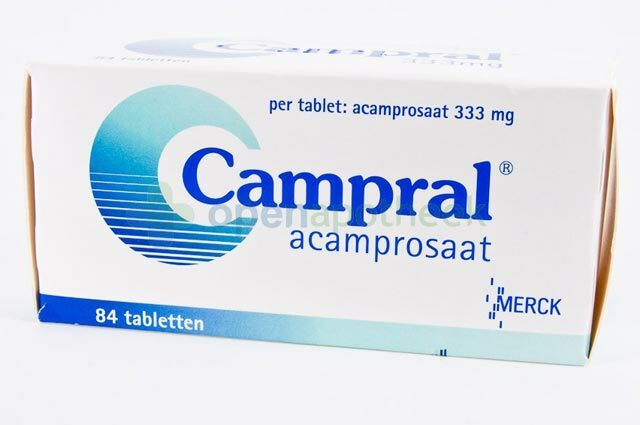 The best way to think of acamprosate is that it is a stabiliser. It helps to realign the chemical imbalances created by long-term alcohol consumption. GABA Receptors – These brain receptors are critical to the proper functioning of certain types of neurotransmitters. Long-term alcohol addiction substantially decreases the sensitivity of these receptors to a point of near uselessness. Acamprosate is believed to make up for the deficiencies by stimulating production of the chemicals that would otherwise have been produced naturally had these receptors remained undamaged. NMDA Receptors – These receptors are classified as biochemical receptors. They receive information from the brain and, in turn, tell the cells to which they are bound to perform a certain action. Alcohol abuse leads to the overproduction of these receptors to the extent that there can be and ‘overload’ when alcohol consumption ceases. Acamprosate is believed to reduce NMDA production so that overload is less severe. Neuroprotective Benefits – Some studies suggest acamprosate also protects certain neurons in the brain from being damaged or destroyed because of alcohol withdrawal. This also helps to reduce cravings. In getting to the question of dosage, it must be understood that acamprosate is only effective when used in combination with a support group or individual counselling and total abstinence from alcohol. If either of these two conditions is not present, the drug is rendered ineffective. The typical dosage is 666 mg three times per day. Tablets are taken right after meals and should not be chewed due to the coating on them. It is also important to remember to take the tablets at the same time every day. This reduces the chances of missing a dose. The 666 mg dosage can be adjusted according to the age and weight of the patient. A doctor will make the correct determination upon writing the prescription. It is important for patients to follow their doctor’s instructions explicitly for taking acamprosate. general – headache, dizziness, drowsiness; vision problems; general weakness, cold or flu-like symptoms; dry mouth, decreased or distorted sense of taste; sweating, mild skin rash; numbness or tingling. swelling in the face, throat, or mouth. It is a good idea to talk with your doctor about the potential side effects of acamprosate before beginning to take it. For some people, the risks outweigh the rewards. That’s something for each individual doctor and patient to decide after a thorough consultation. 1. Can acamprosate be taken during withdrawal? As previously stated, acamprosate is ineffective unless combined with appropriate counselling and alcohol abstinence. If you begin taking the drug during your withdrawal, it will not help. You will be wasting both your time and money. 2. Can acamprosate cause weight gain? Some people experience increased appetite once they begin taking acamprosate. However, it is not yet determined whether the increased appetite is a result of the drug or a neurological response to ceasing alcohol consumption. Either way, some weight gain should be expected with increased food intake. 3. What if I relapse while taking acamprosate? The good news is that relapsing while taking this drug will not do any physical harm. The bad news is that it is likely to be completely ineffective for you from that point forward. You may have to switch to another drug should you suffer a relapse. 4. Can children and the elderly use of acamprosate? The drug has proved effective in alcohol abusers of any age. However, extreme caution must be used when prescribing it to children and the elderly. The effects of acamprosate can be more pronounced in these two groups of people. 5. Can acamprosate be taken by pregnant women? Any drug can be problematic for women who are pregnant. However, continued alcohol use can be equally problematic. Pregnant women can take acamprosate after consulting with a doctor about appropriate dosage. 6. Is acamprosate dangerous for women who are breastfeeding? To date there is no evidence suggesting that acamprosate can be passed on to infants during breast-feeding. However, not much is known in this regard. Breast-feeding mothers should certainly consult with a doctor before beginning acamprosate use. 7. What do caregivers need to know about acamprosate? One of the more serious side effects of this drug is an increase in depression and thoughts of suicide. Caregivers need to pay special attention to observe mood swings and other behaviours that might suggest suicidal thoughts. 8. Can I continue to drive while taking acamprosate? Dizziness is one of the potential side effects of this drug. Patients should avoid driving, using heavy machinery, or doing other activities that could be dangerous until they know how they will react to the drug. If dizziness is not experienced within the first couple of days, it generally will not be a problem. 9. What do I do if acamprosate doesn’t reduce my cravings? Acamprosate is a drug that does not work for everyone recovering from alcohol dependence. If it doesn’t work for you, there are other options available. Furthermore, if you relapse and acamprosate loses its effectiveness, you will need to consider one of those other options. 10. Can I give my prescription to someone else? Acamprosate is a very powerful drug that has definite impacts on brain function. Therefore, it must be carefully prescribed by a doctor according to an individual patient’s needs. Never give acamprosate to a friend or relative on your own. Instead, those individuals need to seek the advice of their own doctors. Alcohol dependence is a condition that is destructive to the individual drinker as well as his family, friends, and co-workers. It is nothing to be laughed at. Thankfully, alcohol dependence can be conquered with the right attitude and plenty of help and support. If you are suffering from alcohol dependence, your first step is to get in touch with an organisation that can help you stop drinking. Once your alcohol consumption has ceased you are a prime candidate for an acamprosate prescription. That’s the time to see your doctor. If, after consultation, you and your doctor decide acamprosate is right for you, taking it could result in the reduction or elimination of your alcohol cravings. If you do start taking the drug, do not plan on it being something you’ll need forever. Once you have been away from alcohol long enough your brain should begin to recover its chemical balance naturally. Combined with ongoing support and counselling there is no reason why you cannot eventually stop taking the drug while remaining alcohol free.